Have you ever had a guinea pig? It’s been a long time since I’ve had one, but they were so fun to have around and always happy to hear the refrigerator door open! Let’s see how well you know their dietary needs. Q: What vitamin are guinea pigs not able to make in their body? 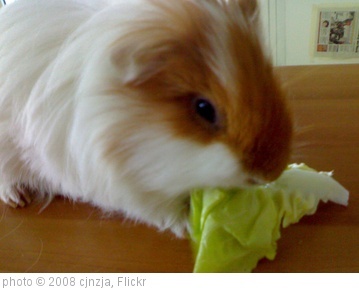 A: Guinea pigs don’t make vitamin C so it needs to be supplemented in their diet. The best way to add vitamin C to their diet is by offering them fresh foods that contain the vitamin, such as kale, parsley or broccoli. Next week will be the last chance to get an entry into February’s Pet Pop Quiz so be sure to come back on Monday! Nope, never had a guinea pig. Can you teach them tricks?